It's that WONDERFUL time of the month again, my ribbon-loving friends! 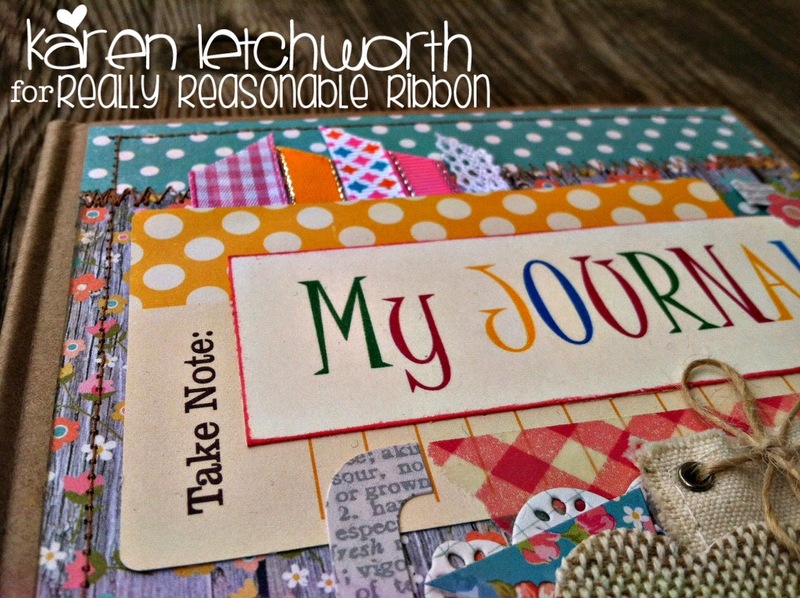 Time for another super fun and inspiring BLOG HOP with Really Reasonable Ribbon. You should have arrived here from Bonnie Garby's Blog. Wasn't that awesome? If needed, you can start the hop on the Really Reasonable Ribbon Blog. This month, we have the CUTEST, brightest, most fun ribbons in our Ribbon Club Assortment. This wonderful collection can be used for birthdays, get well cards, summer projects, and just about ANY type of uplifting or fun card or project you can imagine. I created a fun, bright card AND a diary/journal. I paired this month's lovely colors with Simple Stories patterned papers and embellishments. They matched SO beautifully. First, I will talk about my card. I took three of the patterned papers and machine stitched them together. Next, I added a little 3-D sticker embellishment with the Turquoise Satin Swiss Dot Ribbon along its side, and added snippets of the Medium Pink Plaid Ribbon, 3/8" Satin With Metallic Edges in Tangerine and Summer Fun Confetti Dots Grosgrain Ribbon peeking out from the sticker. Then, I tied a long length of the sweet Raspberry Baker's Twine around the bottom of my card, and tied a bow with it. Really Reasonable Ribbon carries a wide variety of Baker's Twine in both solids and traditional stripes. It is a WONDERFUL addition to any card or project, it comes in almost every color you can possibly imagine, and it costs just ten cents per yard. 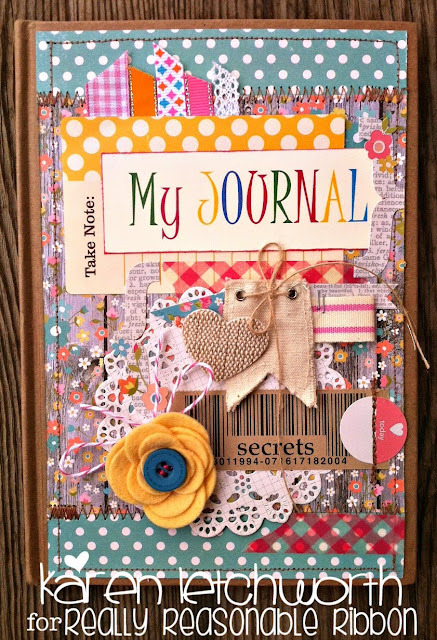 My diary/journal was made by taking a Natural Smooth Lined Journal and covering it with lots of great patterned papers, washi tape, a canvas heart, some machine stitching, a Maya Road canvas tag, a burlap heart, a die-cut doily......yeah, there's a lot going on here. Around the wool felt die-cut yellow flower, I tied a big bow made from Raspberry Baker's Twine. I also tied a length of Natural Burlap String onto the Maya Road canvas tag. I just love how the Baker's Twine and Burlap String gives a soft, sweet touch anywhere on your cards and projects. Both of these fabulous trims come in a wide array of lovely colors, and cost just ten cents per yard at Really Reasonable Ribbon. Towards the top of the journal, you will several of this month's Ribbon Club ribbons peeking out from the title above the October Afternoon journalling card. They include the Summer Fun Diamond Print Grosgrain, 3/8" Satin With Silver Metallic Edge in Tangerine, Paulette White Crochet Lace, Medium Pink Plaid Ribbon, and Hot Pink With Silver Edge. They are all SO bright and fun. I hope that this has inspired you, and that you will continue to hop along the rest of the Blog Hop to see more of our fantastic Design Team's creations. Your next stop will be at Teresa Horner's sweet blog, and I know she has something lovely to share with you all. Happy blog hopping, and don't forget to answer the question at the end of the hop to become eligible for the awesome RRR prize. Stamp & Create - June Challenge/Summer Fun - I really thought these bright colors said SUMMER to me! That journal is sooooooo cute! 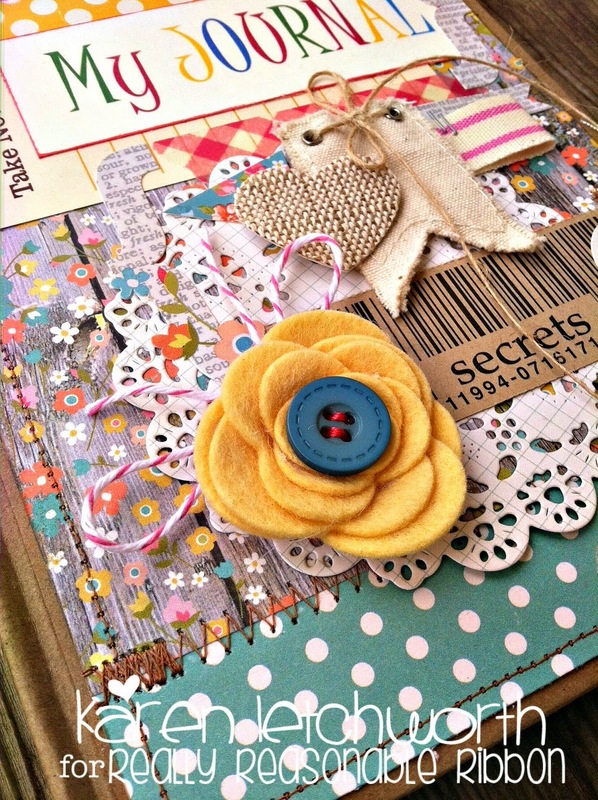 I love the yellow felt flower and the wonderful stack of goodies you layered on the front! Beautiful projects, Karen! Beautiful projects Karen. I love all the bright colors and different patterns. Looks like summer! Both the card and journal cover are just wonderful Karen! 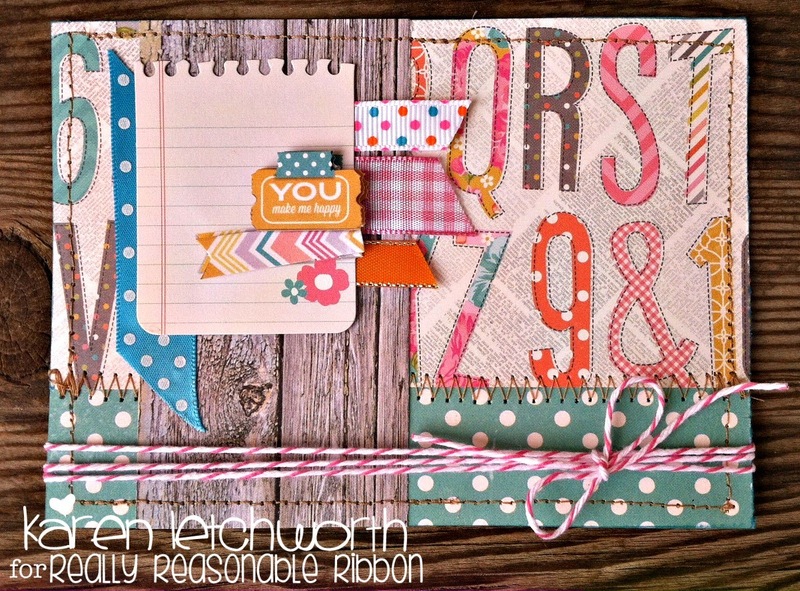 I absolutely adore all of the different elements you layered and the fishtail banners tucked in that you created with the ribbon kit assortment. colors sure do get your attention, and this is a good one to do that. love it. sweet and gorgeous. what a wonderful fun card ! your always so very creative. some times I don't seem to have the MOJO to do my card . But with you around you make everyone feel so very blessed and creative. 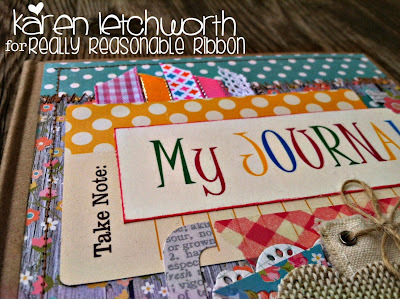 you are an amazing Lady and a true positive plus to the blogging world..
What a great way to use up some smaller bits of ribbon! You really like color. So do I and I love both your card and journal. They are great. Thanks for sharing. 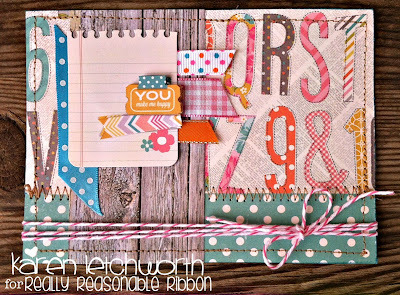 Such beautiful and summery colors and what a creative way to use those gorgeous ribbons, too...wonderful journal, what a treasure! WOW!! Beautiful!! LOVE them!!! :) Have a Crafty Weekend! Love all the fun colors, layers and textures and of course all that delicious ribbon!!! I really like your journal. A lot of amazing things going on there, lots of fun ribbons and embellishments. Thanks for sharing. Oh Karen, there's so much eye candy here and literally in the colors of candy! I just adore your projects today!! Karen these are amazing! I love all the ribbon, layers, and elements! Absolutely fantastic! Wishing you a wonderful weekend! God bless! Love both your card and journal. They would certainly brighten up anyone's day if received as gifts! very lovely fabric stitched journal w textures from the gorgeous ribbons! What fun and colorful projects! Wow Karen - these are stunning nd such colourful projects!